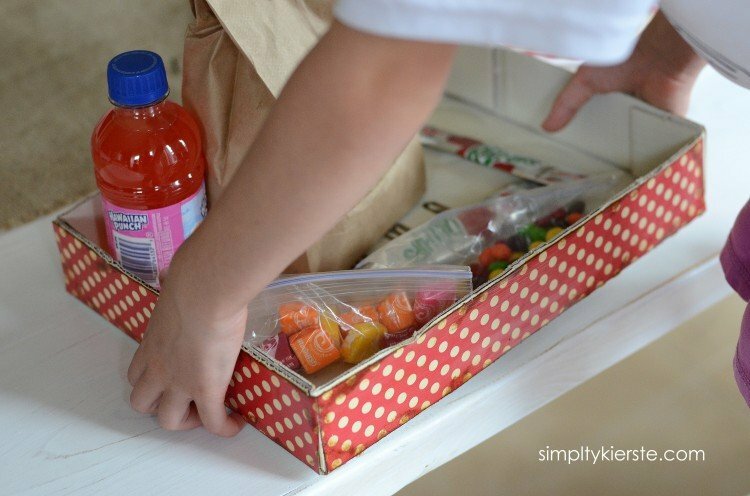 If you’re doing a family movie night, and are either doing a concession stand or having treats, having fun movie boxes are perfect for keeping everything in! They’re super easy to make, and DARLING! cardboard flats with sides–pick them up at the grocery store on your next trip! Look for boxes with sturdy sides and bottom, and no nicks or cuts. Dust off your boxes, and make sure they are free of any lint. Paint them with the spray paint. 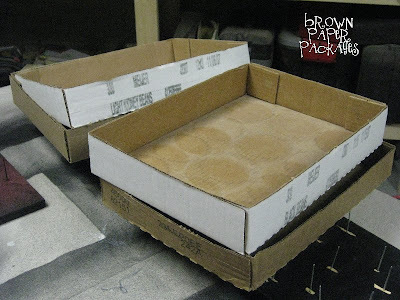 The inside bottom and sides need to be done well–no cardboard showing, but the outside doesn’t need to be perfect, since you will covereing most of it up with paper. Let dry. ***Painting tip: Take several large pieces of plywood or solid wood boards, and hammer in very long nails into them, so that they poke through on the other side at least an inch or more. (see my painting pics…you’ll see mine) When you’re ready to paint, lay the wood down with the nails pointing up. This will provide a great surface to set the items you’re painting on…allowing you to get at all angles and not have to stick to the surface. 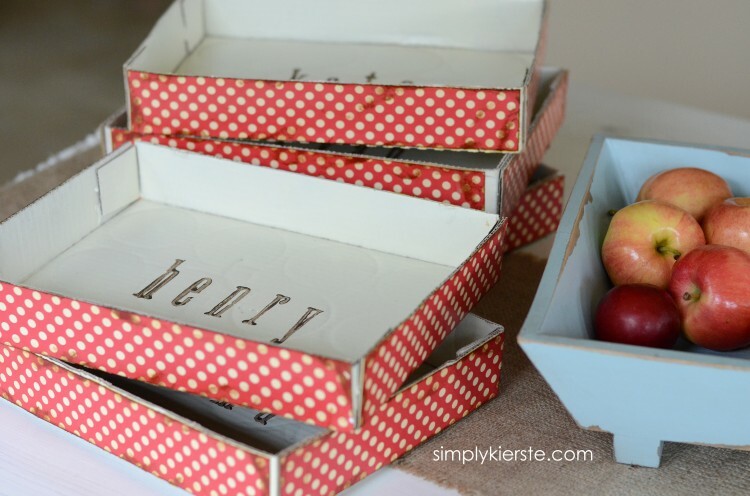 Measure the sides of your boxes, then cut scrapbook paper to fit. Using the foam brush, apply a layer of Mod Podge directly onto the box. Place your paper on the box, then add another layer of Mod Podge on top. Repeat on all sides. Let dry. Stamp desired names in the middle of your box using craft paint and foam stamps. I like to use my finger to apply the paint to the stamp–it allows for more control over your paint. You’re done! You’re ready for movie night! Read all about having a concession stand with your family movie night HERE! It’s SO fun, and a really great motivator! Too cute. I luv the Tarjay One Spot and I think we NEED those popcorn containers. I need to do this..especially the monopoly money for chores! You always have really cute ideas. what a great idea! i'm hosting a 8 day giveaway check out my blog! Wow – those are so cool! I love the polka dots!What a fun movie night!!! Adorable Kierste! I totally love the trays. Right now at Michaels they have oh so cute popcorn containers as well and they are only a dollar!!! I'm impressed, this idea is wonderful. Great idea! We do something similar at our house! Love the target popcorn containers! I got them for the twins birthday party in the fall and we use them all the time! Best thing was the price tag!! I will have to make this for my son's last day of school party! I'm planning on doing an "Outdoor Movie Theater" theme! I mentioned you in last night's blog posting! Thank you for all of your inspiration! 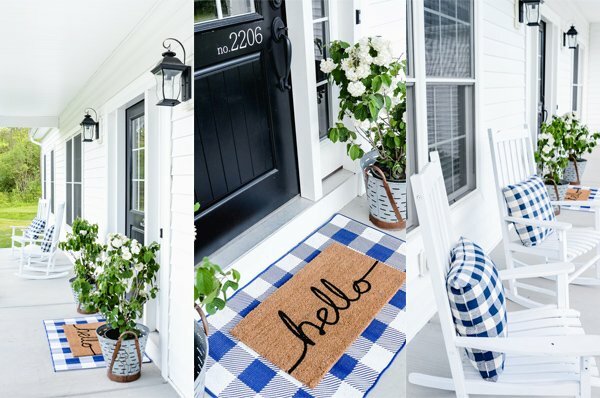 Such a cute idea… PLUS no popcorn spills! Sooooo cool!!! Seriously makin' these! What a great idea! I would love to do a weekly movie night with my family. We need some glue to hold us together, that might just be it! Thanks for sharing! How great! I am going to make these for my son's 4th Movie Birthday party! Thanks so much for sharing!